Here at W&L, we’d like to put one of those burdens at ease. Our Puppy Bloom is the complete food for growing puppies of all large & giant breeds from 2-18 months. You can sleep peacefully knowing that your new family member is growing stronger and healthier, every single day. Breed Lifecycle - Large & Giant Puppy From 2-18 Months. 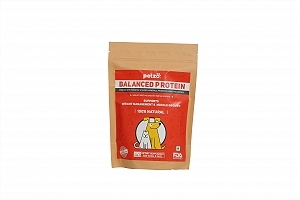 Ingredients - Boneless fresh chicken (20%), dried chicken (20%), peas, chicken fat, potato, sweet potato, pure salmon oil, carob pods, flax seed, brewer’s yeast, egg powder, (chelated) minerals, inulin (source of FOS), carrot, nettle, echinacea, apple (0.15%), mango, banana, thyme (0.15%), basil, spirulina, cranberry, celery, glucosamine (0.02%), chondroitin (0.02%), yucca extract.